People hope to eat their way to happiness in different ways, but we’re better off understanding why our brain is so obsessed with food. Loretta Breuning answers readers questions about the brain chemicals that make us feel good. 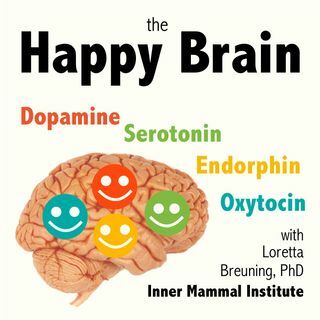 If you have more questions, check out the Inner Mammal Institute, read Habits of a Happy Brain, and then contact Dr Breuning to ask your questions on the show! Happiness is caused by four special brain chemicals: dopamine, serotonin, oxytocin, and endorphin. When ... See More you know how they work in animals, you can find your power over them in daily life. The happy chemicals are not designed to flow all the time for no reason. They evolved to reward behaviors that promote survival in the state of nature. They are only released in short spurts, so you always have to do more to get more. This makes life frustrating!